Here’s a question many of you have asked since we moved to Spain. 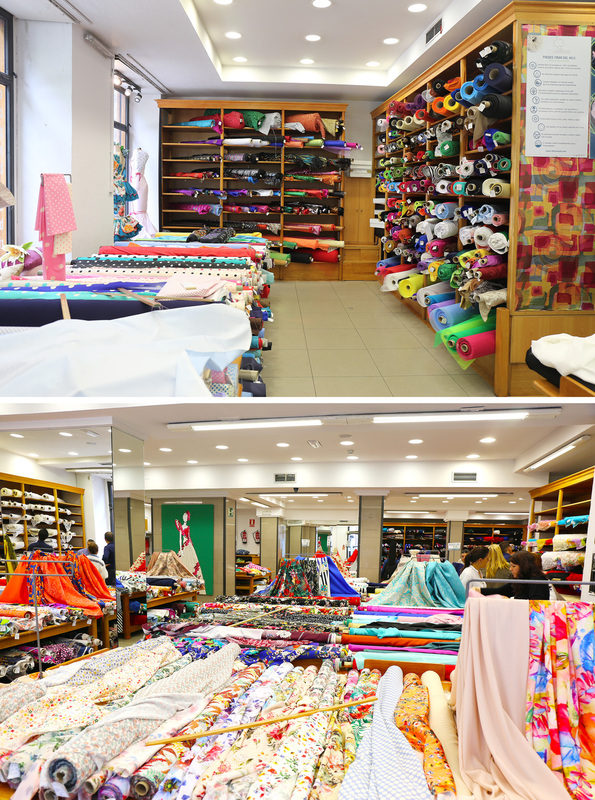 Where are the best fabric and trim stores in Madrid? Since we live right in central Madrid and I buy a lot of fabric, I feel quite qualified to answer this question! And the good news is that most of the stores are very close to each other as well as being close to many of the major tourist attractions. Central Madrid is small and very walkable, so get ready to explore and enjoy. When we first moved to Madrid I realized that many sewing terms aren’t easily translated, so we created the Sewing Translator, which many of you have contributed to and use. I love how convenient it is when I’m shopping for fabric and trims and don’t know how to say “satin,” for example. I hope it will be useful to you as well in your travels. Sewing Translator is now available in 14 different languages, and if you have an iPhone or iPad you can download it to use the native iOS app off-line as well. We hope you’ll make good use of it! You can find Sewing Translator in the Apple app store, and it’s free. So, let’s get started. 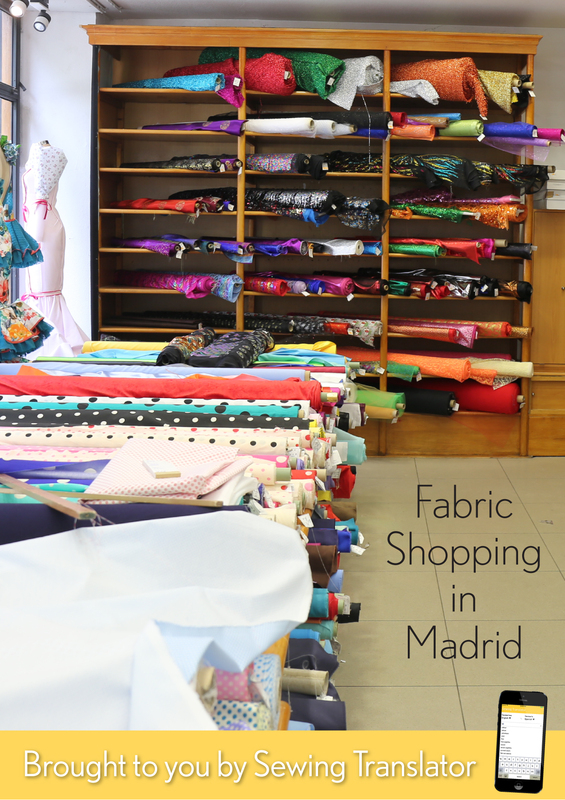 Here’s my guide to fabric and trim shopping in Madrid. Let’s start with trims because Madrid has some really spectacular trim shops, and they can be found just off the famous Puerta del Sol in an area know as Pontejos. I presume this is because many of the trim shops are located on or near Calle Marqués Viudo de Pontejos and Plaza de Pontejos. The most famous, and also the largest, of these shops is Almacen de Pontejos, which is about as old-fashioned as you can get when it comes to shopping. It’s like a dry goods store, and when you shop someone behind the counter assists you with retrieving and assembling your purchases. This shop is always busy and can be a bit overwhelming at first, but the staff is there to help. 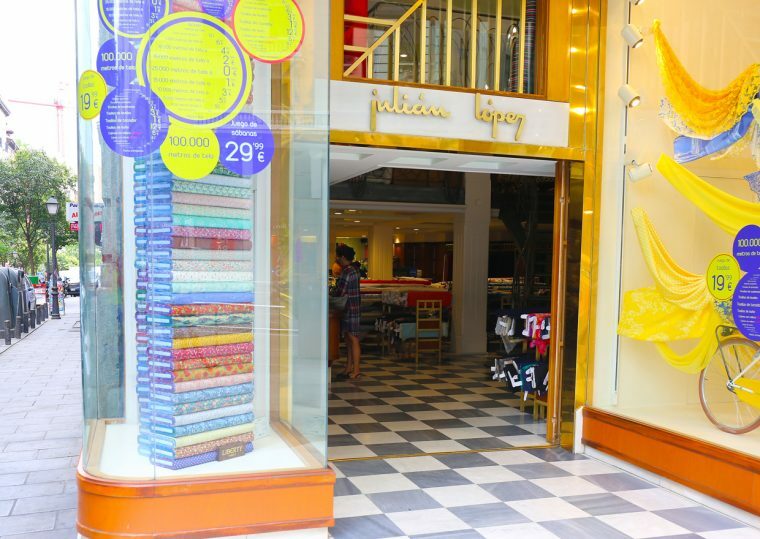 Once you’ve made your selections you move the cashier to pay, where you’ll find your selections wrapped up in cute little paper packages to be taken home. To be honest, I prefer to browse so I can see what’s available for myself, since you never know what treasures you’ll discover. But chances are that if you ask for something here they’ll have it. S likes to look at the buttons, which are located in front of the counters on old wooden rollers. 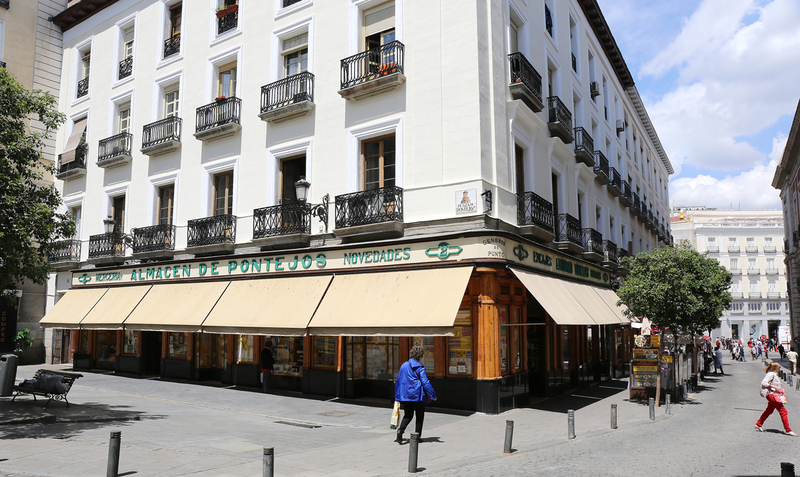 Next door to Almacen de Pontejos is Almacen Cobian, which is a much smaller contemporary mix of browsing and counter help. When I need a spool of thread or elastic in a jiffy and don’t want to wait at the big store, this is where I go. These are my two favorite trim shops, but be sure not to miss the others in this immediate area, too! Several of them are quite charming, and you’ll find all sorts of treasures inside. You’ll notice a few fabric stores near Pontejos, particularly Los Tejidos de la Maja, which specializes in special-occasion fabrics. 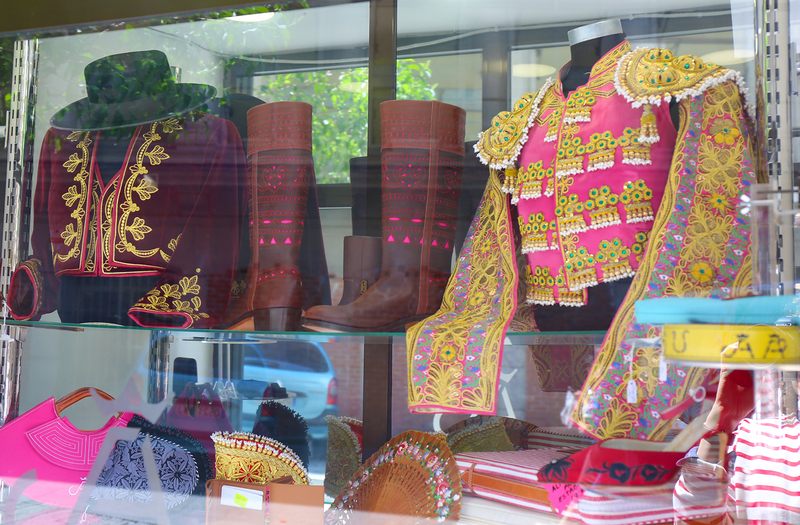 On your way south on Calle de las Paz don’t miss the Justo Algaba, which specializes in the toreador suit. 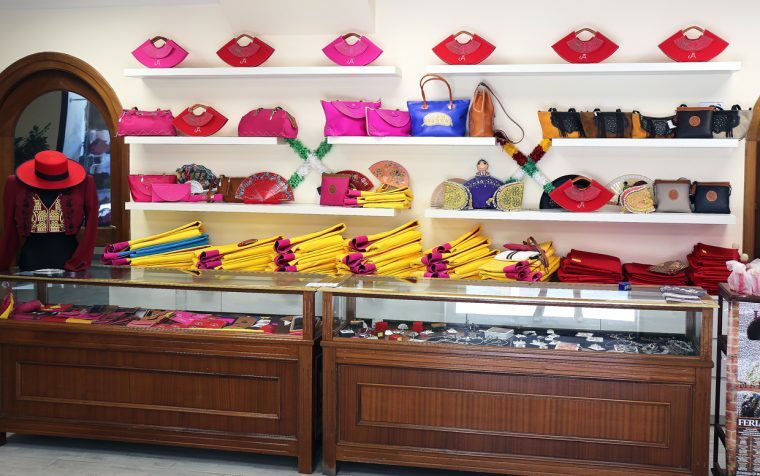 It’s fun to peak inside to see all the elaborate bullfighting capes and accessories on display, and you can find a nice selection of authentic toreador souvenirs here as well. 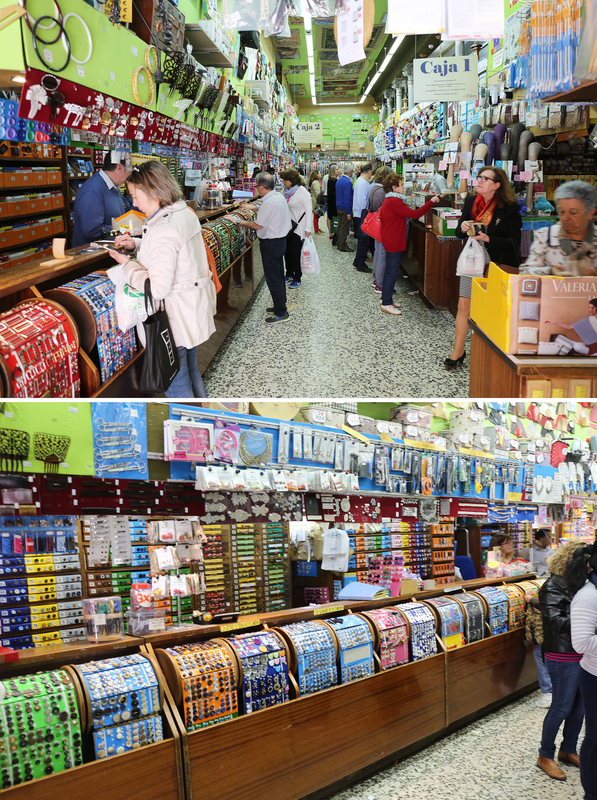 My favorite fabric stores are located on Calle de Atoche. Look for Ribes y Casals, which carries a nice variety of fabrics including a rapidly changing assortment of seasonal fabrics. This is where I do the majority of my fabric shopping, and the staff here is very helpful. A block down the street from Ribes y Casals is Tejidos y Novedades Paredes, which is a less expensive shop with a decent variety of fabrics. The fashion design students in Madrid seem to do a lot of their shopping here, since you can sometimes find bargains. In general, I find the fabrics here to be of lower quality and lower prices, but you can find an occasional treasure. If you start back at Pontejos (the trim stores) and head in the opposite direction, across Puerta del Sol and over to Gran Via (which you should stroll while in Madrid, just to see the spectacular Beaux Arts buildings), you’ll find my other favorite fabric shop, Julian Lopez, which carries a wide range of Liberty of London lawns and a constantly changing array of seasonal fabrics. They often carry very high-end fabrics like fancy laces, silks, and other special-occasion fabrics (Spain loves to dress up! ), so it can be a lot of fun to see what’s available here. And of course you won’t want to miss seeing the Velázquez, Goya, and El Greco at the Prado (don’t miss King Carlos! ), as well as Picasso’s Guernica at the Reina Sofia. But as a textile aficionado, you’ll also want to schedule a tour of the Royal Tapestry Factory, where you can see tapestries still being meticulously made by hand! Photos are not allowed, but you’ll love the colorful spools of fine thread and watching the process itself. 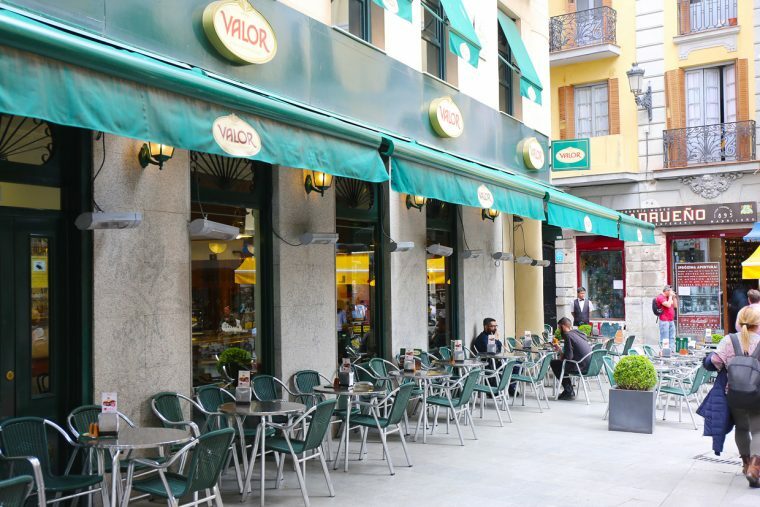 When you’re near the Royal Palace, stop by Santa Eulalia for coffee and a delicious French-style pastry and to see remnants of the old city walls under the glass floors. This is one of our favorite neighborhood hang-outs and a great place to relax and catch your breath, so be sure to say hello if you run into us there! I hope this guide will be helpful to you on your next trip to Madrid. I’ll be sure to write a similar post for New York soon. We would like to expand this into a series of posts about fabric shopping in cities all over the world, and we would love to have you contribute a post on shopping for fabric in your hometown. If you’d like to contribute a guide to your city we’d be delighted to hear from you! Email me at askme@oliverands.com to get in touch. Oh you have sent me on a trip down memory lane … complete with pictures. I have very happy memories of shopping in a trim store in Barcelona which revealed stunning hand painted Catelonisn buttons. Three of these gems now adorn a fabulous hand felted winter hat I own keeping happy Spanish memories alive. Have you got the hang of buying fabric in metric measurements yet?! I love this and would love contributions for other city’s. I still have a frustration for wanting to sew something for myself, researching fabric online, ordering, having it arrive and hating it. I’m thinking buying fabric online us a learned skill – one I still haven’t developed. Hah! I was in Madrid just the week beforehand, and had to look up internet shopping guides to find good fabric shops. I speak Spanish well so it was straightforward but I would have loved to have had this guide before I went instead of afterwards 🙂 I did find Ribes & Casals, and had a nice walk up Atocha to boot, ending up at Anton Martin and the old Cine Dore. 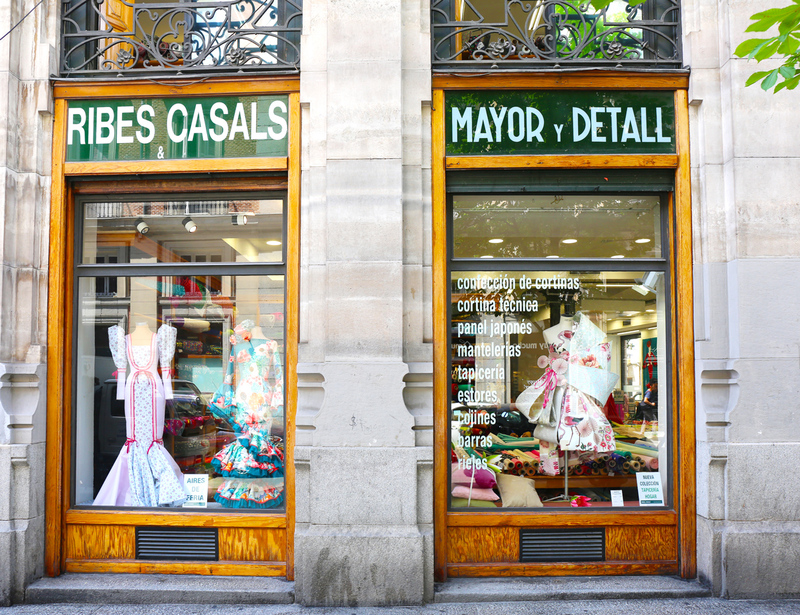 Ribes & Casals was a little overwhelming to me as a relative novice sewer without a specific project in mind, but I did buy some nice bias binding and some haberdashery necessities (hook & eye set for a skirt). The range of fabrics was awesome, and I loved the spotty flamenco fabrics and the rainbow window display to celebrate Pride. Hi, I will be traveling to Spain (Madrid, Barcelona and Malaga) in May 2018. I hope to purchase Spanish-made fabrics suitable for backpacks. Would you be able to point me to a shop or even a local weaver that would meet this hope for me? Thanks in advance! This is great! Traveling to Spain for a wedding in July. First going to Barcelona and then to Madrid. Any good fabric shopping in Barcelona or should I wait for Madrid?! Alyson, there’s lots in Barcelona. It really warrants its own post. But sadly, neither Liesl nor I know enough about Barcelona to write it! Enjoy your travels. Any insight into shopping in Seville? I am traveling there for Christmas this year and would love to get to some textile shops! And places with thin rolled cork! Thoughts? Thanks in advance! I’m reading this blog post, and following where it leads me, when I should be packing for my upcoming trip to Spain. Thanks for the tips! I’ll be in Madrid from mid-September to mid-October, and these stores are high on my to-do list. I really hope to find great trims and silk lining for the Chanel-like jackets I’m making. I’m also taking a class on Lunéville embroidery at Teté Café Costura. Have you been there? Thank you for sharing! I am looking for lace in Madrid, Granada or Sevilla. I will go to Spain in June. I came across your blog. Great suggestion about the Royal Tapestry Factory! I am originally from the Loire Valley in France and I had a friend from Souzay Champigny who dedicated most of her life to the world of silk from planting mulberry trees to weaving the fabric. This area abounds of interesting things to see like the troglodyte caves. Hope to read more on your blog and please let me know where I can find Spanish lace. Annick, there are a few places near Pontejos here in Madrid where you can find hand-made lace. It’s still made!